The Penguin Theory This is the year penguins will fly. After a bit of a hiatus on the Alphabet Dating front we have finally gone on Date D! Ash had been talking about it for ages but we never seemed to find the right time to go. All I knew was that it was in Cockfosters and it was a meal. As it was a meal I wanted to dress up, even though I had no Idea how posh this place actually was. I had bought this new lace top recently and decided I wanted to wear it. I thought it went well with this pretty, but plain, purple top underneath. The skirt is one of my favourite wardrobe items and had exactly the same shade of purple as my top and so I decided to mix patterns and go for a lace and tribal look! It’s a shame my hair is so unruly at the moment (it’s in a dire need of styling) as I think the mix actually turned out better than I actually expected! I decided to team it with my usual black tights and pixie boots. Click the picture to see it on Lookbook! 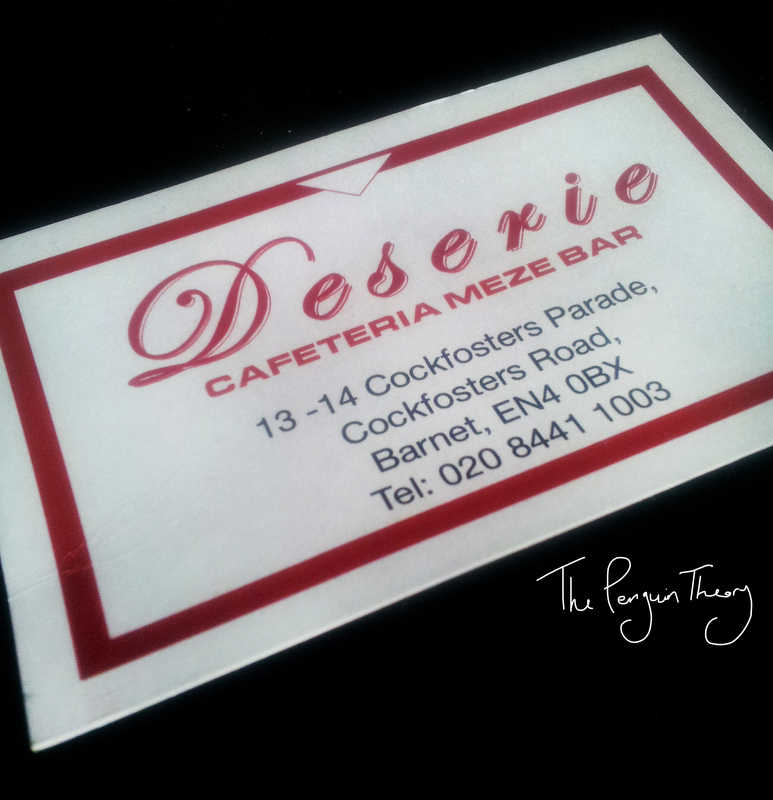 The place he took me to was a Greek restaurant called Deserie. It was extremely busy (always a good sign) and we were given a table provided we were out in an hour as they already had it booked. It was a lot more expensive than we were expecting, but then we’re used to Wetherspoon prices and are both quite stingy at times. I really fancied calamari but decided the price was a little too much for our budget and so settled for chicken skewers whilst Ash had the pork. 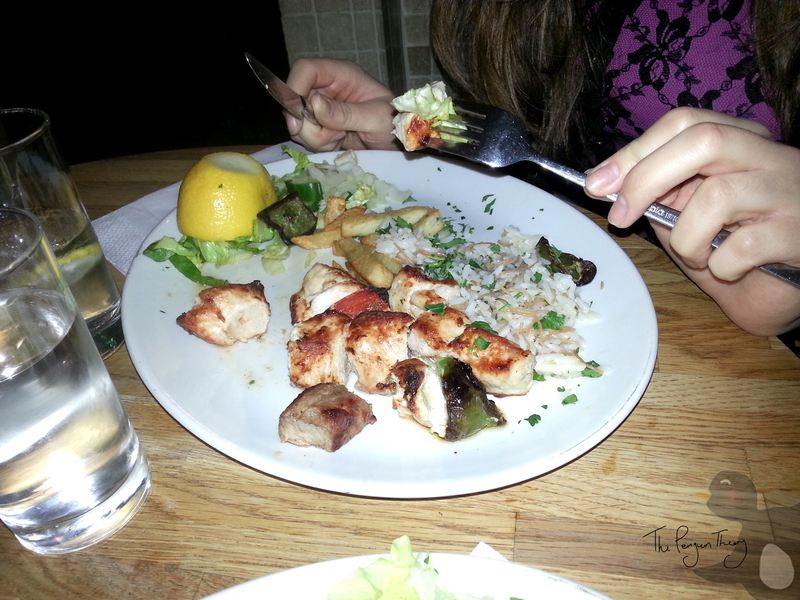 The skewers came with a salad and a choice of chips or rice and were delicious! My chicken was tender and succulent, ash wasn’t so lucky as the pork was a little tough but still tasty. My rice was soft and lemony and left my mouth watering for more! For pudding I was extremely tempted by a chocolate fudge cake, but decided that I should go for one of the Greek choices as I can get a fudge cake at my work. 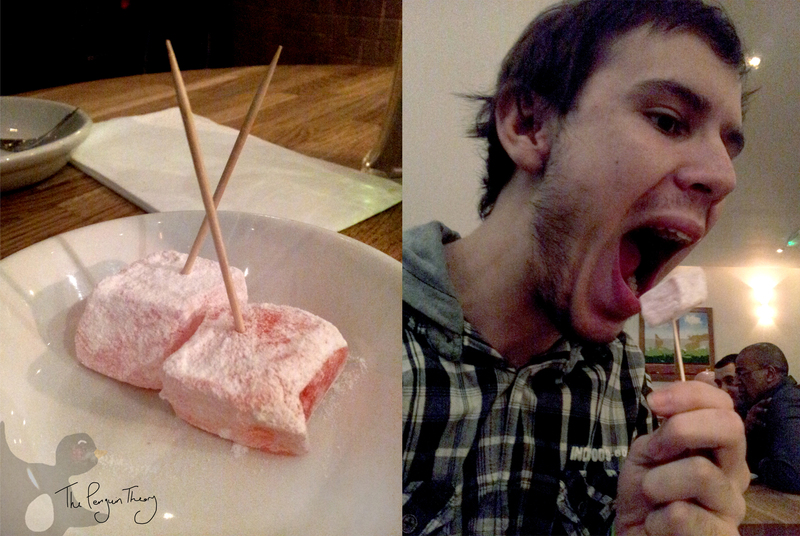 Before our dessert we were given some tasty jelly things on sticks and some pineapples with grapes. Delicious! I eventually decided on Gelatoboureko, or at least that’s what I ordered. 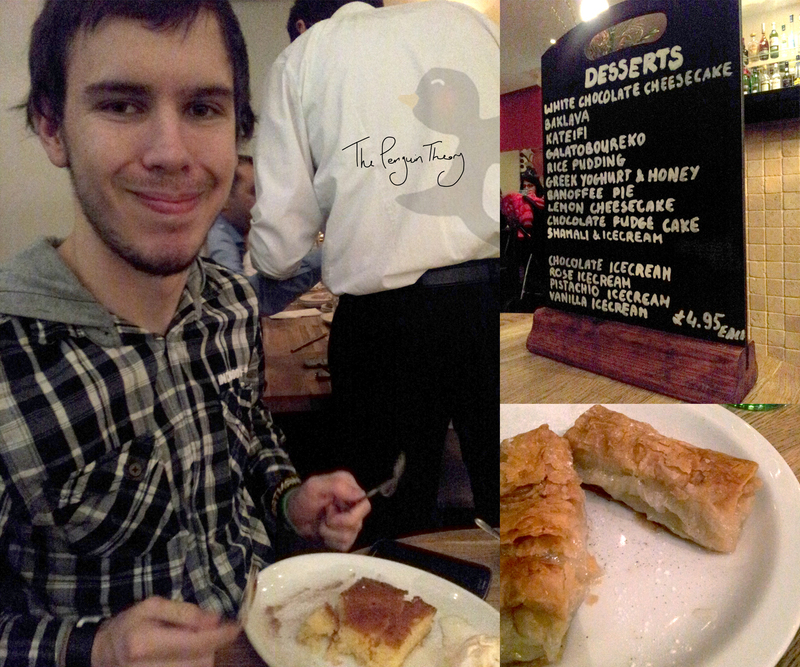 I think I was actually given a Baklava after looking on Google as it was a sweet pastry rather than a custard pudding. What ever it was it was delicious, Ash said they tasted a lot like the South African treat koeksisters. He ordered Shamali and Icecream which was a semolina based pudding and also delicious although we both preferred my dish. The whole night was very enjoyable. We talked nonstop and we’re constantly laughing, one of the reasons why I love being with him, we just always seem to be having fun and very rarely argue. The staff at the restaurant were very friendly, the food did take quite a while to come out but it was extremely busy (and a huge birthday party table ordered just before us) so they can be forgiven. The food itself was delicious, pricey but delicious. I think we would definitely go again, although maybe when money isn’t so tight. Overall Date D = Success! Now I need to think of a something to do for Date E! Anyone got any ideas? Visit the Penguin Theory Etsy Shop!